Author: Donald Willett and various contributors. Description: A collection of historical essays on the island city's history. 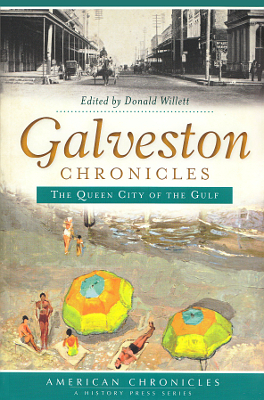 Named for Bernardo de Galvez and established in 1839, Galveston measures just over two hundred square miles. In early Texas history, however, it was actually the largest city in the Lone Star State, as well as a hugely important port that would become a strategic target during the Civil War. The Oleander City survived the depredations of war and flourished, a resilience it would also display in the wake of the devastating hurricane of 1900. From early cannibals and pirates to the woman suffrage movement and Nazi POWs, Galveston’s amazing story continues to evolve today. Join thirteen of Texas’s most noted scholars and historians as they share this remarkable island history. Contributors include Donald Willett, Patricia Bellis Bixel, Chester Burns, Gary Cartwright, Margaret Henson, Arnold Krammer, David McComb, Bill O'Neal, Merline Pitre, Robert Shelton, Edward Simmen, Elise Hopkins Stephens and Larry Wygant. 206 pages. Viewed: 1,892 times since August 13, 2013.